Tungsten Marker – excellent images of source in Ultrasound, X-ray, Fluoro, CT and MRI – for superiority to other commercially available sources. Sources and spacers are the same length (5mm nominal) and diameter (0.8mm nominal), fitting the Mick catridge snugly. Sources and spacers are the same length (5mm). Double wall encapsulation and uniform wall thickness with superior dose distribution. Consistent quality, and seeds fit Mick cartridges. Excellent visualization with Ultrasound, X-ray, Fluoro, CT and MRI. 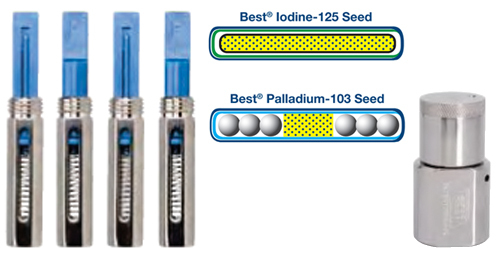 Real time dosimetry possible with Best™ seeds. Complies with AAPM’s dosimetric prerequisites. Available in all ranges of seed activities (0.08 to 0.4 mCi) with a shelf life of 90 days. Needles are supplied sterile and are individually packaged and shielded. Best localization needles with Iodine-125 seeds are FDA approved. We are the only one to provide comparative calibration data traceable to NIST, Washington, DC, University of Wisconsin, K&S Associates, and M.D. Anderson Hospital, Houston, TX, for the past 15 years, which indicates excellent quality control. We are the only one to provide custom services for Gold-198 permanent implants, as well as a wide range of activities. We are the first and only one to call our customers the morning after shipping to inform them of mode of transportation and expected arrival time. Best Medical International now offers durable highly uniform Co-57 Flood Sources for gamma camera quality control. Common rectangular and round configurations are available from inventory, as well as custom sizes. All Flood Sources are measured to ensure a coeffi cient of variation of less than 1% and certified in accordance with ANSI N42.27-1999. 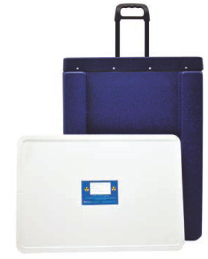 Each Flood Source is provided in a shielded storage case. 5302-2416-10*-S With Case 24" x 16"
5302-2416-15*-S With Case 24" x 16"
5302-2416-20*-S With Case 24" x 16"
5302-2416-10* Without Case 24" x 16"
5302-2416-15* Without Case 24" x 16"
5302-2416-20* Without Case 24" x 16"
5302-1814-5*-S With Case 18" x 14"
5302-1814-10*-S With Case 18" x 14"
5302-1814-15*-S With Case 18" x 14"
5302-1814-20*-S With Case 18" x 14"
5302-1814-5* Without Case 18" x 14"
5302-1814-10* Without Case 18" x 14"
5302-1814-15* Without Case 18" x 14"
5302-1814-20* Without Case 18" x 14"
5302-1610-5*-S With Case 16" x 10"
5302-1610-7.5*-S With Case 16" x 10"
5302-1610-10*-S With Case 16" x 10"
5302-1610-5* Without Case 16" x 10"
5302-1610-7.5* Without Case 16" x 10"
5302-1610-10* Without Case 16" x 10"
5302-1111-5*-S With Case 11" x 11"
5302-1111-10*-S With Case 11" x 11"
5302-1111-5* Without Case 11" x 11"
5302-1111-10* Without Case 11" x 11"